Size S: 4 1/2" Diameter. Size M: 5 1/2" Diameter. Special oblique mouth design. Simple and modern, give you a different life of emotional appeal, modern design to any space. As a party or wedding decoration, believe also attracts a lot of attention. 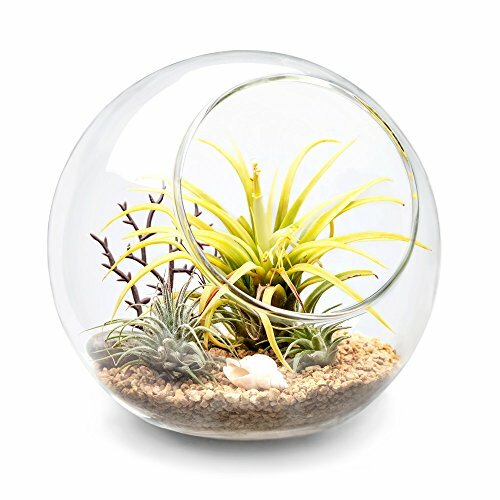 This cute and beauty little glass terrarium is the perfect vase for your imagination. It is made of High boron silicon glass, high quality and very practical. Strong and durable, water-saving drought- resistant, pervious to light, not easy deformation, corrosion resistance. Suitable for balcony garden, furniture, home gardening and fit for desk, hotel, or home and wedding decoration. Perfect for an air plant, flowers, sand, colored pebbles. Also, it can be used as a candlestick, creat sweet atmosphere. Special oblique mouth design. Crystal clear hand-blown glass, Create a fashion life atmosphere, Make your life more poetic and relaxing. Application: balcony garden, furniture, home gardening. Also suitable for desk, hotel, or home and wedding decoration. Modern design to any space and make you more sweet and warmness. Size M: 5 1/2" Diameter. Please note that this item is not include any accessories. Mkono is a registered trademark and our product is professional manufacturing and sole selling.